It has been a while since I last saw Wicked. I used to go a lot when the show first started and I’ve always enjoyed my trips to the Emerald City. I guess Wicked is just one of those shows that need someone in the cast I really want to see to get me booking again. And with Louise Dearman taking over as Elphaba and Jason Winter joining the ensemble that has happened at the end of October. First of all I think Wicked is a superb show. It has some gorgeous songs, great characters and an interesting and catching storyline. I have always been a fan of big voices so for me the show stands and falls with the singing abilities of the leads. Acting is important as well, of course, but personally I can forgive some acting glitches as long as I get blown away by the singing (I know it’s the other way round for others). 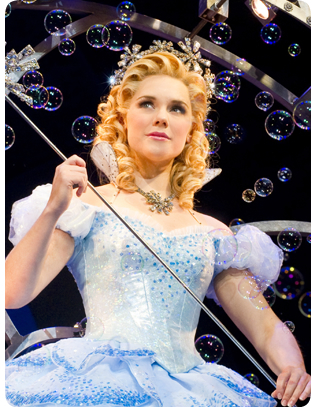 I have seen Louise Dearman as Glinda and I loved her take on the park. She was funny without going completely over the top and her singing was fantastic. 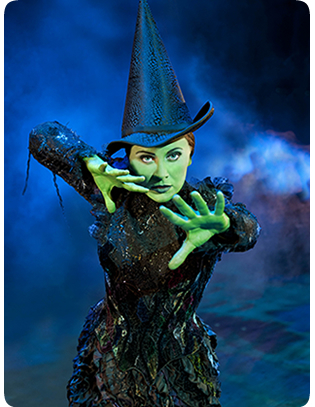 Her Elphaba is acted flawlessly in my opinion. She manages just the right mix of vulnerability and anger and makes Elphaba a character I can feel for and whose motives I can follow. I admit I wasn’t completely convinces by her singing during act one. Her “Wizard and I” was good but not outstanding and she seemed to struggle with the high notes at the end of “Defying Gravity”. However, her “No good deed” was absolutely stunning and the best I’ve heard since Kerry Ellis (who I adored in the part vocally). I’m sure Louise will be a brilliant Elphaba once she has settled into the role a bit more and has gotten used to singing those difficult songs night after night. It was my first time seeing Gina Beck’s Glinda (that shows how long I haven’t watched the show!) and I fell in love with her portrayal right from the start. Her singing is nothing but amazing and I loved that she manages to balance the part properly. She is funny while still keeping the character real. 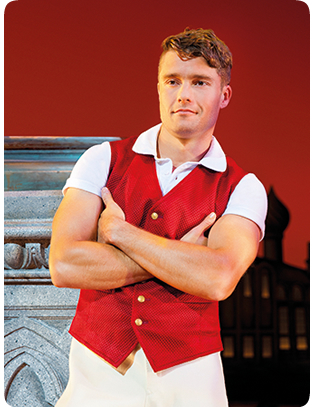 Ben Freeman has taken over as Fiyero and I admit I was sceptical towards him in the part after seeing him as Warner in Legally Blonde (yes, I didn’t enjoy his portrayal). I did however try and watch him with an open mind. Sadly I ended up not liking his Fiyero at all. His acting was alright but to me he looked slightly out-of-place most of the time and I didn’t feel any chemistry between him and Louise. Plus his singing was weak compared to the previous Fiyeros I have seen. 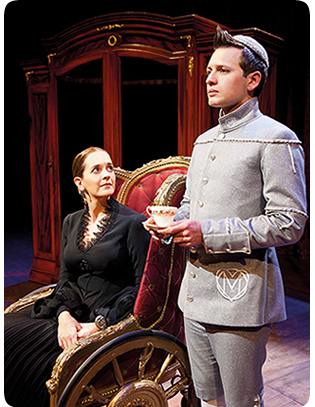 Having played the part in the Original London Cast Katie Rowley Jones has returned to play Nessarose. I loved her when I first saw her years ago and I still love her now. For me she plays Nessa just how she should be played. I wasn’t too impressed by Sam Lupton as Boq. He’s missing cuteness if that makes any sense. James Gillian is still the best Boq I have seen because he was simply beyond adorable. Sam came across as too secure and lacked a bit of the little boy charm Boq should have. Keith Barlett is doing a fine job as the Wizard. I don’t really like the tone of his singing voice but that is just my personal preference. I really enjoyed seeing Louise Plowright as Madame Morrible. Same goes for Christopher Howell as Dr. Dillamond. The new ensemble appears fresh and full of enthusiasm which is a joy to watch. These guys and girls will be absolutely fantastic once they been in the show a few more weeks. And I’m really looking forward to seeing some of them in their cover parts – especially Jason Winter as Fiyero who I think will be quite amazing. 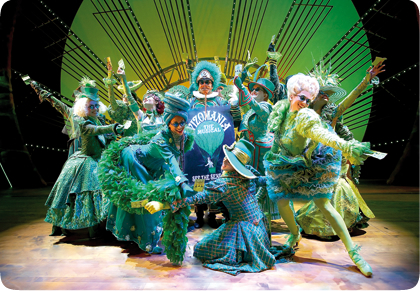 Wicked is still a blockbuster of a show and fun to watch. The current cast is – with few exceptions – one of the best I’ve seen in the London production. I definitely recommend a visit even if you’ve seen the show before with a different cast. It’s worth going again to see the new guys and girls for sure. Wicked is playing at the Apollo Victoria Theatre. For more info and to book tickets go to http://www.wickedthemusical.co.uk/.